Long time no hear from Patchou, but (luckily for us) the hot summer sun drove him behind his computer and he started working on one of the most often requested features for the Messenger Plus! addon: Tabbed Conversation Windows. As you can see, just one unique chat window that gives you access to some or all your current chats. Also added will be a language field for Custom Sounds. Stay tuned for more news (like a release date) on the next version of Messenger Plus!. The Return of the Mess.be News Search! Thanks to John you can now easily keyword search the Mess.be news posts again, all thousands of them and back to July 2002! Just enter your keyword(s) in the Search News Archives field next to the emoticon with the magnifying glass and hit the search button. UPDATE: We're aware of the current slowness of the search box and are looking into it. Gaim, the multi-protocol pimpin' IM client, has gotten its monthly update. Version 1.4.0 doesn't contain any stuff on the MSN Messenger front, just general bug fixes. Are you feeling lucky today, Ozzies? Hillier pointed us to this list of Australian winners in the Logitech and MSN webcam competition. We're aware of a bug in the latest version of Mess Patch which disables stealing emoticons from your contacts. Rolando is on it and you can expect a fix very very soon. You've probably read this elsewhere first, as I was away when this happened, but Vodafone and Microsoft have signed a deal to provide MSN Messenger on mobile phones. A new service, due to go live before the end of the year, will let users see each other online and exchange instant messages between PCs and mobile phones. It is hoped the service will bring together the 165 million MSN Messenger users with Vodafone's 155 million customers. Read more here. Coeluh reports that MSN Messenger users worldwide are putting the flower emoticon (F) in front of their MSN Display Names to express their grief for the victims of yesterday's bombings in London. As you've all heard by now, there has been a terrorist attack in Central-London leaving more than 30 dead and hundreds injured. Our thoughts are with all the victims and their families. Feel free to use the MSN Display Picture on the right to show your disgust to such barbaric actions. You know by know that I have a weak spot for Threadless, the online t-shirt shop with user-submitted designs. Well, guess what, they have some new tees and reprints from which I've created MSN Display Pictures. >> Get your Threadless Display Picture. >> Visit the Threadless shop. >> Other display pics you can wear. As we previously reported, MSN is giving fans new ways to take part in the reality-show craze by launching http://rockstar.msn.com, the official web site for Mark Burnett Productions' Rock Star: INXS. The show, which aims to find a new lead singer for the multiplatinum rock band INXS, premieres July 11 on the CBS Television Network in the U.S. The show also will be aired in Canada, Australia and some Asian countries. Airtimes and stations will vary by market. Fans of the show will be able to sign up for MSN Alerts and a weekly newsletter that give the scoop on everything related to Rock Star: INXS. MSN has developed MSN Messenger content around Rock Star, including Winks and Dynamic Display Pictures. The company will also facilitate MSN Messenger chats between fans but most importantly, people will be able to vote to determine the outcome of the contest on the site and via MSN Messenger. The online voting process promises to give increased prominence to the IM application. Similar shows, such as American Idol, have only allowed voting by phone or by text message. >> Visit Rock Star: INXS. After some speculation about graphical changes (according to Messer Pierce) and the replacement of a couple of default Winks (said Chris), MSN Messenger Program Manager Leah Pearlman finally delivers hard facts about the last week released MSN Messenger 7.0.0816. So, what's new, Leah? Starting with this build your Tab usage is measured in the interest of MSN. With accurate click data, the company will be to attract Tab partners and keep generating revenue from MSN Messenger while keeping it entirely free to the end user. Previously, all extended characters in the text of optional CVR toasts were either not displaying at all, or displaying as gibberish. In particular, users with Simplified Chinese, Traditional Chinese, Japanese, Korean, Russian, Greek, Arabic and Hebrew clients in were receiving toasts that looked much more like viruses than they did encouragements to upgrade to v7.0.0813! You might've read it on our forum or heard it from friends: users are experiencing far fewer successful logins to MSN Messenger 7 than they did to the 6.2 client. The built-in Customer Experience Improvement program was not specific enough to help Microsoft figure out why so many failed logins were apparently occurring. New datapoints have been added to help them get more granular information about what is really going on with logins. Clearly these changes were all desirable to the developers of MSN Messenger, but as you can see all of them affect us in an indirect way. Yet the annoying bug that allows one to send unlimited Nudges remains unfixed. Why?? >> Download MSN Messenger 7.0.0816. 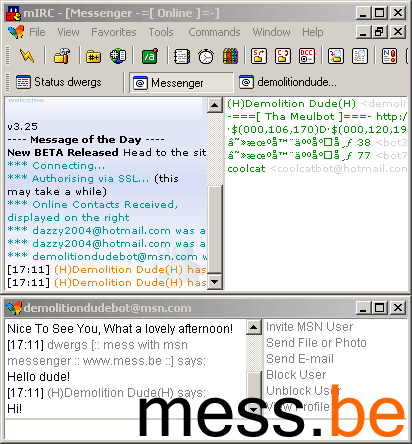 >> Download Mess Patch for MSN Messenger 7.0.0816. One year after 3H Group Pty unleashed its cute little MeeGos, the official MSN content partner is now selling its own MSN Messenger 7 Winks dubbed MeeWinks. They do not feature the typical cartoon-like MeeGos but other characters like Doug, Lili and Steve-O (a stickman figure, not the jackass). Currently 5 packs of MeeWinks are available for USD $3.61 each (or USD $3.96 if you pay through PayPal). Each pack contains three to eight different Winks. Up to you if you think they're worth it! >> To order MeeWinks visit MeeGos International and select your country. MSN is giving you the chance to win an MSN Messenger 7 video conversation with the Stereophonics by just answering a simple question ("name the band's Welsh home town"). The prize consists of one pair of Logitech headsets and webcams and a 20 minute video conversation with the Stereophonics at a time and date of Microsoft's choosing. The competition will close on Sunday 17th July 2005 and is open to UK residents only. The winner will be notified by email before Friday 28th. >> Enter the contest here. >> Look for (Logitech) webcams for MSN Messenger on eBay. Mr. Fart, the illustrator who created our Mess Mascotte (scroll all the way down and look left) and contributed an exclusive MSN Display Pictures pack, is one of the people behind Belgian singer Ronny Mosuse's new video. If you watch it, or just have a look at the DP next to this post, you'll definitely notice the typical Mr. Fart touch. Well done man! Next up, Pixar? >> Visit the Mr. Fart homepage. >> Watch the Ronny Mosuse video (it's Dutch... and it's pop... you've been warned). >> Download CustoMess and install the Mr. Fart Display Pictures under the Artist Showcase category. Just when I thought the project was dead, Andy Carvell updated his mIRC plugin which allows you to log into your Messenger account inside the mIRC client. Version 3.46 works correctly with Windows 2000 and XP and comes with new features like flashing chat windows, a comments system and an "MSN Block Checker" (read here if you don't know why I "quoted" that). >> Download MSN Messenger for mIRC. >> View screenshot #1 and screenshot #2. A new official MSN Messenger game called Spin the Bottle and branded by Fanta, has been added to the games menu of U.S.-based users. Don't expect virtual kissing with your hottest contacts or anything, because despite the name it's just a pop-themed trivia quiz. You can play all market-specific games through our MSN Games Launcher. Remember that this launcher is also useful when your games menu for some reason won't appear. >> Play Fanta Spin the Bottle and other official MSN Messenger games. >> Add extra third-party games to MSN Messenger 7.0.0816 with Mess Patch. For older versions use Koen's Custom Games Patch. Microsoft at last discovered the marketing power of Messenger bots and has allowed "What's Your Story? "-sponsor Volvo Cars of North America to exploit an official chatterbot through the .NET Messenger service: "Volvo BOT is a smart computer that you can chat with about all kinds of things. Volvo BOT is polite, and sometimes quite charming. And unlike most of your friends and coworkers, Volvo BOT is available to chat with you 24 hours a day, 7 days a week.". Hold your horses there Microsoft. I haven't talked to it that much but it seems like the now one-month-old Volvo Bot is programmed to talk about cars and not much else, let alone charm you. All it does, really, is fire hyperlinks to Volvo's subpages at you. The effort was there but the results are dreary. Most non-professional bots for MSN Messenger are far better! >> Add volvospace@hotmail.com to your MSN Messenger contact list and start a convo with Volvo BOT. >> More info on Volvo Bot here. While I was getting beer showers and mud footbaths at the Rock Werchter festival, Microsoft silently updated MSN Messenger to 7.0.0816. Thanks to all of you who reported this*! I haven't noticed any differences in this particular build, just the updated images in the Welcome to MSN Messenger startup screen. Lots of you asked for it, and here it is: the new Mess Patch for build 7.0.0816 (thanks Rolando!). If you're not familiar with Mess Patch yet, trust me, you're gonna love it. UPDATE: The Sign-out button can now be added next to the inbox, My Space and MSN Today dashboard buttons in any language.